Frogs are quirky and gross, but as A Chorus of Frogs shows, they're also important: As an "indicator species" -- one sensitive to environmental contaminants -- frogs hold important lessons for humanity. A Chorus of Frogs explores frogs from many angles -- their benefits (they eat harmful insects), their unusual parenting teamwork, and their predators (other frogs, in some cases). Young readers learn the differences between frogs and toads, how their bodies are made (backbones but no ribs), their incredibly precise tongues, and the potent toxin of poison-arrow frogs. Most exciting for children is the amazing transformation from tadpoles with gills to frogs with lungs, from living wholly in the water to jumping about on land. 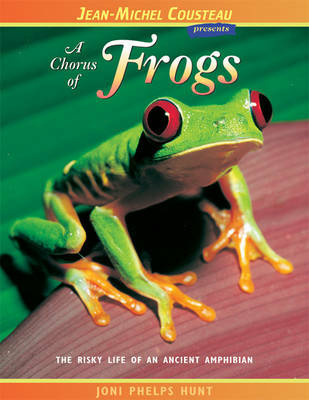 A Chorus of Frogs covers these engaging creatures in easy text and spectacular full-color images.